Former Australia coach Eddie Jones will succeed Alan Gaffney as Saracens' director of rugby at the end of the current Premiership season. Saracens gave Harlequins their first Guinness Premiership home defeat of the season as they beat the home side 20-27. In Pool 4 Saracens ran out 34-26 winners over Viadana after a very shaky start that saw them 26-3 down at half time. 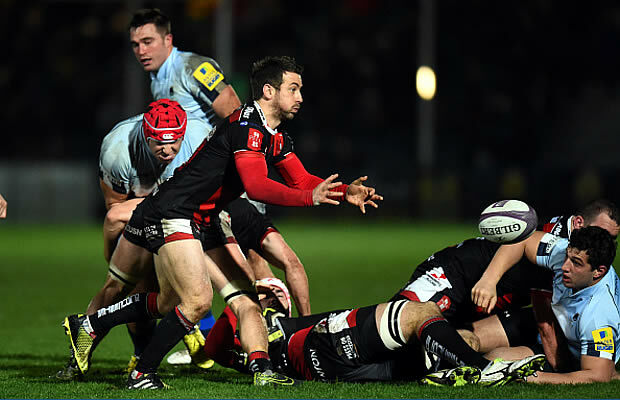 Saracens made it six home Heineken Cup wins on the trot and thumped Viadana at Vicarage Road. Saracens produced a great comeback at Stradey Park to book a place in the EDF Energy Cup semi-finals. Saracens welcome back three World Cup stars into their starting line-up for Sunday's all-important EDF Energy Cup clash against Bristol at Vicarage Road. Saracens secured an impressive 26-19 victory over Guinness Premiership holders Leicester at Vicarage Road on Sunday. Saracens entertain a smarting Leicester Tigers outfit in a mouth-watering Guinness Premiership clash at Vicarage Road on Sunday. Saracens continued their impressive Guinness Premiership start with a 21-16 victory against Worcester at Sixways on Saturday. Saracens have rushed to strengthen their back-three options with the short-term signing of Canada's Daniel Van der Merwe. Saracens have named discarded Springbok scrum-half Neil de Kock as their team captain for the new season.